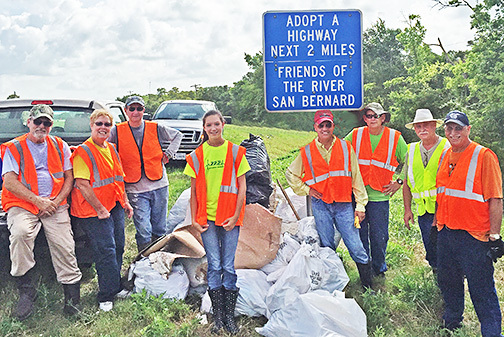 A successful trash pick up took place Saturday, June 20 on two miles of FM 2611 near the Churchill Bridge. Thirty-five bags of trash were piled under the Adopt-A-Highway sign for later collection by TXDOT including half of a birthday cake still in the box along with the spatula. Volunteers who were willing to pick up someone else's carelessly tossed trash and improve the roadside were Rich Watson, Russell York, George Koenig, Carolyn Koenig, Caylie Homniok, Wayne Head, Adopt-A-Highway Chairman Brian Jones, Jerri Lee Mills, Billye Mills-Jones, Mike Pudlo, Tom Ronayne and Fred Kanter. Caylie Homniok, center of photo, is a Sweeny Junior High student working community services hours as part of the National Junior Honor Society. Good job Caylie!